At FamZoo, we believe a parent is a child’s most important role model. We also believe that allowance can be a very effective tool for teaching good money habits. But what if the behavior modeled by a parent is negative? And what if the allowance is treated like an entitlement that is squandered week after week? The repercussions can be tragic. But even in those situations, there’s a silver lining. There’s hope. Why? Mentors can come from many sources: an uncle, a sister, a grandparent, a religious leader — even a trusted friend. And, perhaps most surprisingly, you’re never too old to learn good money habits from a well-administered allowance — even as a full-grown adult. Skeptical? 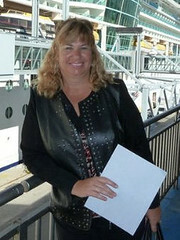 Read this fascinating story from guest blogger Katie Roberta Stevens. 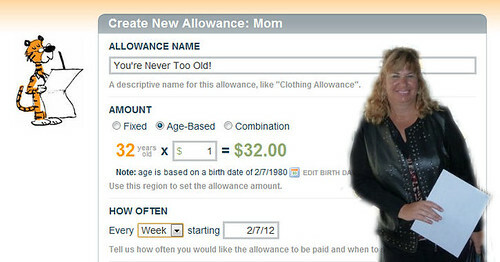 Is there an age limit on eligibility for allowance? At thirty years old, I found myself in despair because I kept making the same financial mistakes over and over again. I was earning an adequate salary, as a high school English teacher, but had to charge gas and food on my high interest credit card just to survive until the next pay period. On a weekly basis, I sneaked into day care to retrieve my son hoping the director wouldn’t see me and ask for her money. Then, at home, I dodged phone calls from bill collectors all night. I was living in a constant sense of panic and felt overwhelmed by shame. Where could I turn? I had already refinanced my debt twice only to have it far exceed where it began. How did this happen to me — a college graduate and Teacher of the Year? Regardless of how you struggle to escape, the old saying, “Children learn what they live” applied to my finances. My four siblings and I were raised on welfare by a schizophrenic mother and no father. We learned that money came each month — no matter what. When the Aid to Dependent Children check came, my mother rushed out to buy pizza, candy and snacks, leaving us with no money for the end of the month. In our teen years, my mother went in and out of mental hospitals, and we were left to steal food and toiletries to survive. There were countless nights when we went to bed hungry and promised ourselves that we would never again live under these circumstances. Yet, there I was, a thirty year old divorced Mom of a 5 year old son, failing to provide a sense of security for him. This three year period was extremely difficult to endure. I felt as if I were being treated as a child. But when it came to finances, I was a child who needed the guidance and tough love of someone willing to parent me. The allowance system worked for me. It will work in your home too. You can save your children years of struggle by enabling them to develop healthy financial habits while they’re young. There is no more important teacher than you, and good financial habits are the foundation for a stable future. As a lifetime educator, I can confirm that children do indeed learn what they live. What financial lessons are you’re sharing with your kids? First rate comments. I'm ordering her book as soon as I send this! Any habit formed over a long period of time will be difficult to break. Habits in the domain of personal finance are particularly unyielding due to the fact that there are so many opportunities for reinforcement in our daily lives (impulse buys, social pressure spending, etc.). The concept mentioned here of an adult allowance seems to be a clever solution to the common problem of financial "tunnel vision" where people have difficulty making good spending decisions on-the-spot with regard to their larger financial goals and limits. Building a sustainable personal budget with a discrete partitioned allowance is a great way to bring wayward finances back on track. With that said, I think the best advice here is actually asking a friend for help. Admitting weakness is never easy, but the benefit of getting advice from someone who lives the life of good personal finance and having the "accountability factor" to keep committed to a difficult change is of immeasurable value. Paying yourself first is the best advice you can give to anyone as personal budgeting becomes a priority. In the world of behavioral finance, it's amazing the impact of knowing that you already have a few bucks in your pocket BEFORE you start writing out the bills. As for what to do with your kids, I will never forget the earliest lessons in savings that my parents gave me. My brother and I both had to start a 'Christmas Club' with our local bank. Every Sunday, when my parents would 'do the money', they would call my brother and I into the kitchen, give us our allowance and then we would have to physically take $2 and put it into an envelope and seal it up for delivery to the bank. Then, in the winter, we'd receive a check for $100, ostensibly our 'reward' for being good savers. In real dollar terms, it didn't amount to much, but being actively involved in the saving and apportioning process of my "own" money early on in life certainly heightened my level of financial awareness as I went into adulthood. Don't be afraid to let your kids be involved with money. The dollar amounts needn't be large, but the principles and more importantly the responsibility are the lessons to be learned. Paying yourself first; a novel concept that seems easy in theory, but more difficult in practice. With the advent of faster, easier methods of financial management, "paying yourself first" can mean not seeing the money at all. ING Direct and many other financial institutions automatically transfer money from one account to another without it ever touching your hands. Think about it. It is much easier to "pay yourself" if you never have to actually go through the process. You resist temptation by not even acknowledging it. Allowances aren't just for kids. Use online tools to budget your money (through your local bank or websites like Mint.com), see where your money is actually going ("wow, I pay $300 for gas each month! "), then create goals to either lower certain monthly payments ("I need to spend less on gas and tolls, cut down on eating out") and stick to a savings amount that goes directly into a high-yield savings account for a rainy day or a larger purchase down the road. Understanding your finances, educating yourself and putting tangible products/services to monetary amounts all make financial stability a proactive exercise that will serve you best in the long run. Great post, important discussion, and one that shows this author's writing ability and depth of knowledge in so many areas. All, thank you for stopping by and leaving such terrific comments on Katie's guest post. @Peter: I agree, having a buddy/mentor to help with accountability and emotional support is really effective. Ideally for kids, a parent can fulfill that role early on. By offering parents simple tools like FamZoo, we're trying to lower the bar for doing so. @Matt: love your "Christmas Club" story. It sounds like your parents were great mentors, and I agree that hands-on involvement is really key. @Jared: I strongly agree that using auto transfers/deductions to automate "pay-yourself-first" before you ever get your hands on the funds is a fabulous technique. In fact, the automated Employee Stock Purchase Plan I had at Oracle way back in 1990 allowed me to finance much of FamZoo today (since I never touched much of it). This has allowed us the freedom to pursue our mission-driven business on our own terms. (Financial independence = freedom!) We try to teach kids that concept with the automated splitting of allowances into spending, saving, and giving. I also agree that Mint is a terrific tool. I use it with my oldest son now that he has real world bank accounts so I can continue to mentor him on personal finance basics as he works toward financial independence. What thoughtful comments… It seems that I’ll have to be a lifelong learner and follower of FamZoo to continue my fiscal education. Your posts indicate that no matter where we started in life, this economy has required most of us to continuously seek new methods to secure and sustain a stable financial future for ourselves and our families. Thank you for providing excellent examples to help others get started. I just read a book that I found on kindle that was so on-target for many women who are attracted to wrong partners. It was such an easy read and yet so profound. I could relate to the heroine in so many ways. I hope other women can learn something from "The Gentleman Chameleon."